High Quality Content by WIKIPEDIA articles! 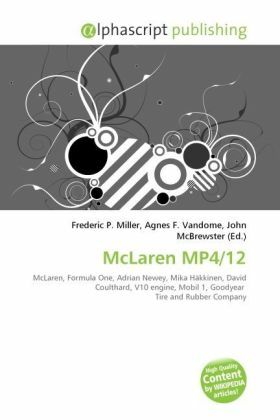 The McLaren MP4/12 was the car with which the McLaren Formula One team used to compete in the 1997 Formula One season. It was driven by Mika Häkkinen and David Coulthard. The car was a totally new machine with engines supplied by Mercedes-Benz for the third year of the Anglo-German alliance. Testing was carried out with the cars painted in the traditional McLaren orange, before a striking new silver livery was launched to celebrate the team's new sponsorship deal with West. This replaced the team's 23-year association with Marlboro. The car proved extremely promising and could have won at least seven races during the course of the season, but reliability proved troublesome, in particular that of the engine. This proved frustrating, especially after Coulthard won the first race of the season in Australia, McLaren's first win since losing Ayrton Senna.